Hey all you print on print ladies out there! Yearning to mix it up, but weary of pairing it all wrong? Well, there's no particular rhyme or reason to mixing prints, but one thing's for sure... it either works, or it doesn't, there's no gray area. Here's a general guideline to mixing prints. I challenge you to rise out of your comfort zone and mix away! 1. The Size Rule: Often times, prints that scale the same size (quarter inch flowers and quarter inch leopard) will work well together. Since the eye isn't heavily distracted by a distortion of sizing, the prints end up meshing well and looking like a natural pair. 2. The Color Rule: Of course, prints in similar color hues have a better chance of pairing well together. Try to find prints that share even one or two of the same colors and lay them on top of one another. Chances are, they can harmoniously blend. Cue: this photographed look. 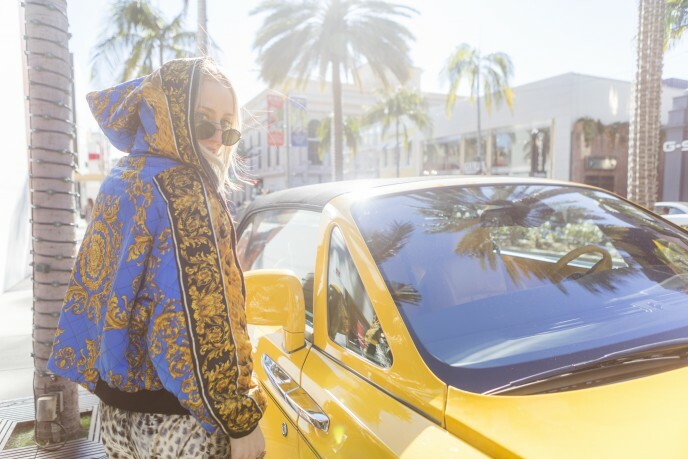 Notice how well the black of the leopard pairs with the black of the "Versace" print? Nailed it! 3. Different Eras, Different Looks: Generally, if you have, let's say a 70's inspired geometric print, I wouldn't suggest pairing it with a 90's funk plaid. Instead, for your 70's geo print, find a like-minded vintage fabric that will transport your look directly back to that time period. 4. Find your Neutral: In this photographed look, I used the snow leopard dress as my neutral. It offered a "blank" (laugh as you will) canvas for the wild jacket and felt like a natural pair. Find your closet neutral print-- maybe it's a tonal plaid blazer, or a polka dot sweater? Both sound trés neutral to me... and pair away! 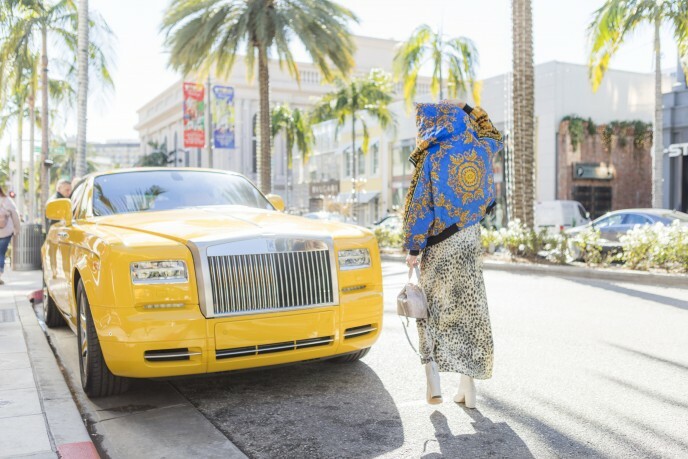 Photographs taken on Rodeo Drive, Beverly Hills, by Sabrina Hill.